Animal Kingdom – At Tamu Tamu Refreshments, in the African section of the park, you’ll find Dole Whip cups along with other ice cream options, like a Mickey ice cream sundae. Tamu Tamu Refreshments also offers a Dole Whip cup with the option of rum. Want to enjoy a Dole Whip without needing a park ticket? Visit one of these places to get your treat on without the price of park admission! Disney Springs – Marketplace Snacks has Dole Whip Floats among many other fun Disney treats. Polynesian Resort – Stop by the Pineapple Lanai while you’re at the Polynesian Resort for a Dole Whip cup or float. It’s the perfect combination with the tropical decor of the resort! Pop Century – Pop Century is now offering Dole Whips to guests at Everything Pop! This is the newest location to offer Dole Whips. We don’t know if this is permanent, but we sure hope they’ll stay! 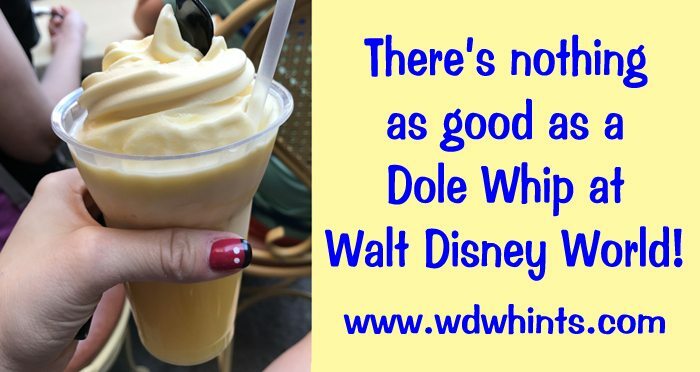 I would highly recommend trying a Dole Whip or a Dole Whip float on your next Walt Disney World vacation. They are simply delicious! Dole whips are good, but my absolute favorite is the citrus swirl! The Citrus Swirl is definitely good stuff too! You just can’t go wrong with any variety of the Dole goodies. ;o) Thanks for stopping by, Becky!